Every spring offers a fresh start, a new beginning for many of our personal and career goals. 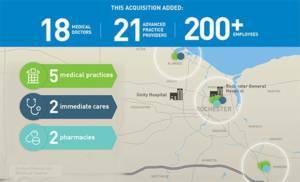 Rochester Regional Health (RRH) is excited to kick off the spring season by welcoming five medical practices, two immediate care centers and two pharmacies to our growing family. A special thank you goes to every RRH department and employee that put in countless hours, even working beyond their scheduled shifts, to ensure a smooth transition for our new colleagues and patients. Your attention to detail from IT, finance and centralized credentialing office services to CareConnect operations and everything in-between was impeccable.We are looking forward to sharing more great news as RRH’s comprehensive network evolves and we continue to fulfill our mission of providing quality, affordable care to the communities we serve. Posted April 6, 2018 under _Featured Stories List, Locations, News, Nurses, Physicians, Weekly Beat.